Thus it was clear that without the Duke provided the remedy the custom would decay and indeed it did. 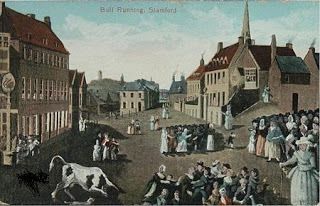 For unlike, Stamford’s Bull Run, the abolishing of the custom in 1778 was due more to the rowdy nature of the crowds in this sleepy town than any care for the animal’s welfare. 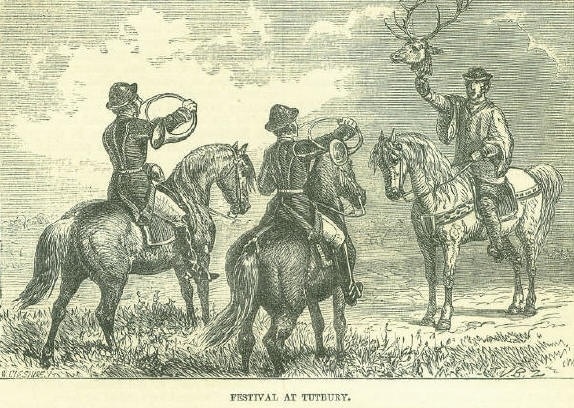 It was finally abolished although the minstrels did meet a few years after this the custom had lost its star attraction and died off. Now Tutbury is quiet on the days around the feast of the Assumption bar some curious tourist visiting its wonderful castle….having thought about a Court which keeps musicians in order…perhaps now this is even more needed to keep our wanton pop stars in order!! 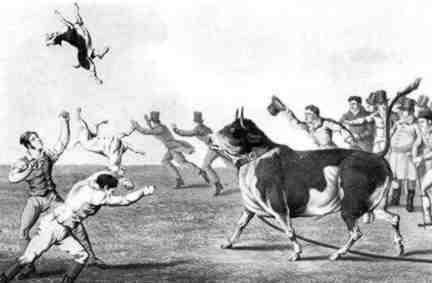 STOP PRESS: Drama re-enactment of the Stamford Bull Run Looks like someone read my notice about acting out the run and this year at the town’s inaugural Georgian festival there is a drama re-enactment of this most famed Bull Run. The date is 28th September 2013 at three. Details from their website..